HE LIVES in a house of cardboard and tin in Puente Piedra, a sprawling poor district on Lima's northern fringe. His mother sells cooked food in the street; his father is a mechanic. Yet César Huamán is studying architecture at a new private university. To pay the fees of $137 a month he works on building sites during the holidays. His parents and six siblings chip in. "We all want to have a professional in the family, even if it's only one," says Inés, his mother. Mr Huamán is part of a revolution in higher education in Latin America. The region has some 20m students, more than double the number at the turn of the century. The gross enrolment rate, meaning the proportion of 18- to 24-year-olds in higher education, surged from 21% in 2000 to 43% in 2013, a faster expansion than in any other region in this period, according to a new report from the World Bank. Many of the new students are, like Mr Huamán, from hard-up families. While students from the poorer half of the population accounted for 16% of the total in 2000, in 2012 they made up 24% of the (bigger) total—an increase of 3m students from such backgrounds. To meet this demand, since the early 2000s some 2,300 new universities or institutes offering diploma courses opened in the region. Many of them are private, and do not set an entrance exam. (Less than half of students are now at public institutions.) This huge expansion is a sign of rapid socio-economic progress in Latin America. It is the result of faster economic growth, the spread of secondary education and the aspirations of an emerging lower-middle class. It is a welcome change in a region with a big shortage of skilled labour. 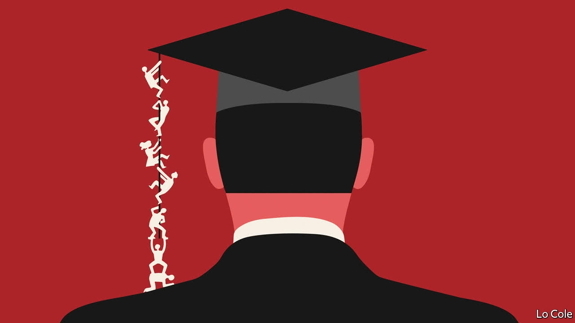 In Latin America, only 14% of the workforce has a higher-education diploma, according to María Marta Ferreyra, the lead author of the bank's report. In the United States the figure is 42%. But there is a catch. Almost half of those who enroll in universities drop out without getting a degree, Ms Ferreyra warns. And some of those who graduate will find that their course was a waste of money, in that the extra salary they might command will not compensate for the cost of the degree and the income forgone while studying. Students from poorer backgrounds are more likely than others to drop out. Neither the public secondary schools that they attend nor their parents, who often have little more than primary schooling, prepare them for the academic challenge of university. After the headlong expansion, Latin America needs to rethink policies on higher education, especially because the region's economic slowdown is forcing some governments to curb spending. The first problem is a lack of information about which courses at which universities are worthwhile. The region has too many students of law and social science, and not enough engineers and scientists. Many of the newer institutions offer a poor-quality education. And the average degree course lasts for five years—an encouragement to drop out. The second issue is whether public funds are being used effectively. Governments have expanded student grants and low-interest loans. But these can have unintended consequences. Free (ie, taxpayer-funded) university tuition, as Chile's president, Michelle Bachelet, proposes, can ease the pressure on students to complete their degrees while being a gift to the better-off. In Brazil there is evidence that student loans have had the effect of pushing up tuition fees at for-profit universities. Peru and Colombia have both introduced schemes aimed at students who are both hard-up and clever, which look to be a more effective use of public money. Mentoring and help with preparing for university could increase the chances that poor students graduate. Proper evaluation and oversight of universities is crucial, too. There has been some timid progress in this. Chile shut down Universidad del Mar, a large, shoddily managed institution with murky finances. Peru has closed several substandard teacher-training institutes. Above all, Latin America needs to offer more variety to its school leavers. Many of those attending bad universities might be better served by expanded and improved vocational training. For people like Mr Huamán, studying at university represents a risky bet. Many families have gone into debt to finance their children's studies. If universities do not offer a better and more predictable return, that is a formula for social discontent. Chile has already seen years of student protests over the high cost of studying. Governments should note that frustrated students are a potentially revolutionary class.